Star Trek V: The Final Frontier is generally considered one of the worst Star Trek films, if not the worst. It certainly has ambitious ideas, but the perfect storm of a writers’ strike, an overburdened Industrial Light & Magic, and a studio desperate to get something to theaters combined to spell disaster for this film. But even a movie as hard to watch as Star Trek V led to several positive results. Let’s look for that silver lining as we explore five reasons why Star Trek V needed to exist. The late Leonard Nimoy directed Star Trek III and the even more popular Star Trek IV. 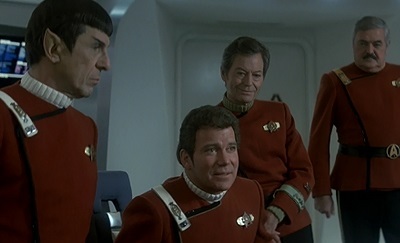 Seeing his friend’s success as a director, William Shatner made his appearance in Star Trek IV contingent on the promise that he would direct the sequel. Star Trek IV: The Voyage Home proved to be the highest-grossing film in the series for many years. It was so popular that it paved the way for the creation of a new TV series: Star Trek: The Next Generation in 1987. If the producers hadn’t acquiesced to Shatner’s demands, we would have been robbed of a truly great film. Even though it also gave us a truly terrible film, it was definitely worth it. In his review of Star Trek VI: The Undiscovered Country, SF Debris recommends watching the “original crew” Star Trek films in the following order: II, III, IV, and VI. He suggests skipping The Motion Picture and The Final Frontier completely. I can understand that logic because those films are mostly disconnected from the other films’ continuity. But if you try to completely write off Star Trek V and think of Star Trek VI as the sole sequel to Star Trek IV, it leaves a gaping hole. 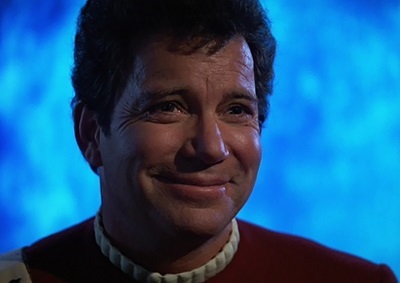 Star Trek IV ends with the brilliant idea to make Admiral Kirk a captain once more so that he can continue to boldly go on adventures on the newly built Enterprise-A. Star Trek VI, however, begins with Sulu as the captain of the Excelsior and Kirk and the rest of his crew all but retired from Starfleet. Clearly, the end of Star Trek IV was promising further adventures with the old crew, proving to Kirk that gallivanting around the cosmos isn’t just “a game for the young,” as he had said in Star Trek II. George Takei famously dislikes William Shatner. The two actors didn’t get along together very well when working on the Star Trek films and TV show prior to Star Trek V. When Shatner became the director of that film, he had to personally assuage Takei’s misgivings about signing on to the project. Over the course of the filming schedule, the two reconciled in a wonderful way. 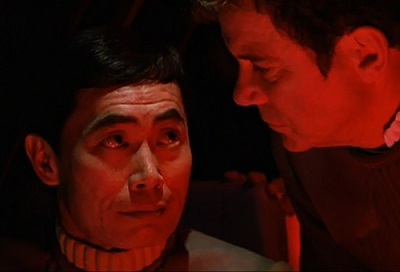 Takei found Shatner to be an excellent director. Shatner was under extraordinary pressure from Paramount Pictures to get the film done on time for its competitive June 1989 release date. That was the same summer that Indiana Jones and the Last Crusade, Batman, Honey, I Shrunk the Kids, and Lethal Weapon 2 debuted, just to name a few of the blockbusters. Star Trek V marked the start (or continuation) of several promising partnerships with talented people. 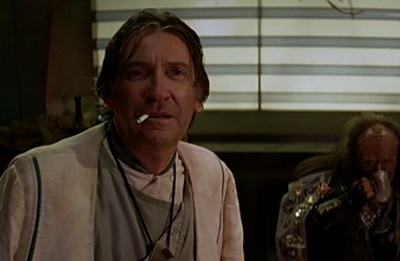 David Warner had a small role as a Federation diplomat on Nimbus III. His character didn’t really add much to the story, but the actor went on to give two extremely memorable performances in Star Trek VI as Chancellor Gorkon, whose death kicks the film into high gear, and a Cardassian named Gul Madred in the Star Trek: TNG two-part episode Chain of Command. He nearly cracks Captain Picard during a long and skillful interrogation. George Murdock played the entity posing as God in the lackluster climax of the film. He went on to play a memorable role as Admiral Hansen in the exceptional Star Trek: TNG two-parter The Best of Both Worlds. Composer Jerry Goldsmith returned to the franchise with another memorable score for Star Trek V. He had gotten the series off on the right note with his majestic score for Star Trek: The Motion Picture, but James Horner and Leonard Rosenman took the reins for the next few films. Goldsmith reused his classic main title theme and Klingon theme this time around. He would later revisit Star Trek again for the TNG crew’s last three films. Hear me out. The first four films in the series had been quite profitable, but Star Trek V was a huge letdown, grossing half as much as its predecessor. This was the first time the series had really faltered, and it looked like it might kill the film franchise. Thankfully, things turned around with the release of Star Trek VI two years later. If it weren’t for Star Trek V, we wouldn’t have seen that the series was strong enough to rebound after a major misstep. The original crew could have come to a lackluster end if this film had been their last, but thankfully that wasn’t the case. More than a decade later, the TNG crew met with a similar misfortune with the release of Star Trek: Nemesis. That film was a box-office disaster, and once again it looked like the film franchise might be finished. Because of Star Trek V, fans could hold out hope that the series could be revived, which it eventually was with the superb Star Trek (2009). It’s funny how something as bad as Star Trek V can be seen in a positive light. Not that any of this makes the film easier to watch, but that it shows the important role the film played in the evolution and continuation of the series, helping it to live long and prosper. This entry was posted in Random Stuff and tagged 1980s, action movies, box office bombs, film score, films, george takei, jerry goldsmith, movie review, movies, music, science fiction, sequels, soundtrack, star trek, william shatner. Bookmark the permalink. A fine defense. I buy it. Great post! 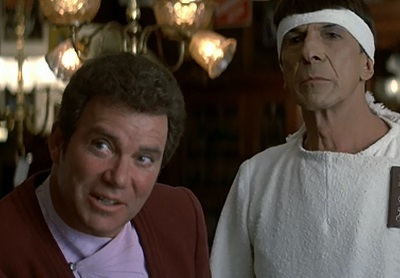 I believe you’re missing the two most important reasons why Star Trek V had to be made. Number one, row row row your boat and number two, what does God need with a Starship. Speaking of which does anyone know the reason behind Spock toasting a “Marshmellon” in that movie. Was it his accent or a copyright thing or something? I’m not going to hold the movie up as one of my favourites but imo it tried. it had an idea and passion and that is more than could be said than some Star Trek movies. A lot of things hurt that film. It was coming off the huge success of Star Trek IV, so the studio wanted another lighthearted film, but William Shatner wanted to do a film about searching for God. Those two things were probably impossible to meld together. ILM was too busy with other projects to do the special effects for the film. Half the actors don’t even look like they want to be there. I do like the quiet camping moments. According to SF Debris’s review of the film, I believe he says the novelization of the film explains that Bones reprogrammed the computer (that Spock relearned his vocabulary from) to teach him to mispronounce “Marshmallow.” Contrived, but at least it’s some explanation. I think Star Trek survived The Final Frontier because TNG was on at the time. In a world without TNG and with the franchise having to survive on its own with just the TOS franchise I think V might have killed it. I enjoy it though, I know it’s bad and I don’t rate it highly on my list of Trek films, but I do like watching it. Part of it is nostalgia, I first saw it as a kid at a time when I wasn’t as picky or always smart enough to recognize a bad film. And I always enjoy seeing the TOS crew in action, no matter how bad the film/episode it’s still usually fun.